Tribute 1 face-up monster; Special Summon from your Deck, 1 monster with the same original Type and Attribute, that the Tributed monster had on the field but 1 Level lower. You can only activate 1 “Downbeat” per turn. 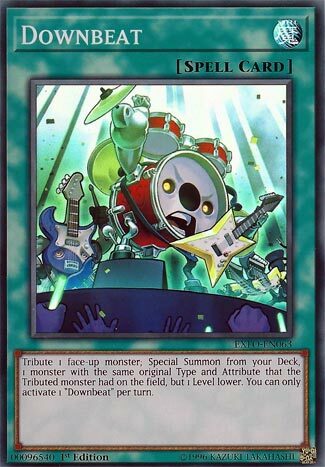 Downbeat could be used in any deck if you have an archetype that runs several different levels of monsters. A 1-for-1 from the deck, same original Attribute and Type as the one you tributed with Downbeat, but a level lower. No imitations so Prisma and Phantom of Chaos are out. Lower level usually means lower ATK, but you may need that certain monster to get that effect, and this card allows you to get to it. Decks like Trickstar, Pendulum Magician, and Qliphorts can run this card with relative ease. Summon a double of a monster you have in the hand, then downbeat it into a different monster. This is also handy with monsters that only get an effect once per turn, or once during the game. It’s an alright card that can fish out something you need. Downbeat is a very simple Normal Spell Card. Once per turn at the cost of a tributed monster you control, you can Special Summon a monster from your deck that has the same original type and attribute but one level lower. Any deck that runs monsters at the same level could not run this effectively. But something like Dark Magician could, buy tributing DM to get DM Girl or something. A deck that utilizes the old Hieratic engine could make use of this as well because they gain effects for being tributed. That would make this card break even instead of being a -1. I believe there will be future potential for this card that will make it quite over powered. As for right now, Downbeat hits a slightly above average note. Remember Transmodify? Now we got the reverse of that with Downbeat. Downbeat is simple, tribute a monster you control to summon a monster with the same original Type and Attribute, but with 1 level lower. A deck I can think of for this is Deskbots, that is the first one that comes to mind for me. I don’t know what else this can be used with, but I can see combos extended with this card. I can’t think of everything this card is good for on the top of my head, just know it is a really good card and I recommend having three just like Transmodify. Next article12″ Macbook: The Future of Laptops?